A few minutes in, Nakamura went to take off the turnbuckle pad, but Lana got on the apron and started to argue with him. Rusev then ran at Nakamura, but he moved and Rusev knocked Lana off of the apron and she “hurt” her ankle. 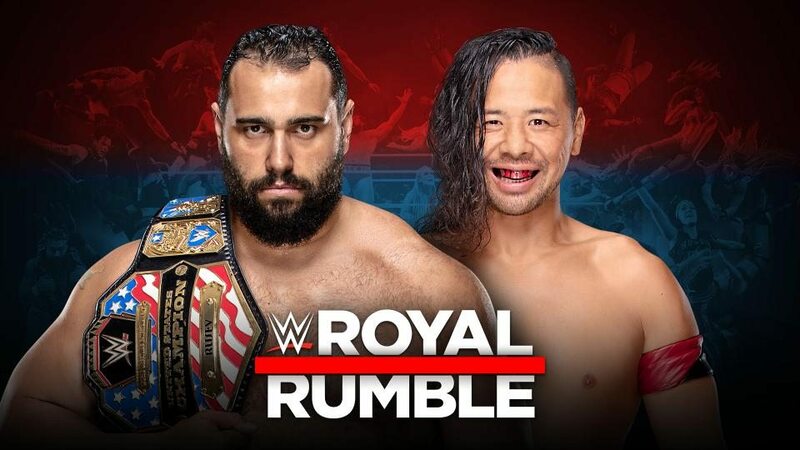 As Rusev looked on concerned, Nakamura nailed him with a Kinshasa for the win. Buddy Murphy won with Murphy’s Law on Itami. This was a pretty good match. A few minutes in, Asuka tried to lock on the Asuka Lock, but Becky was able to escape and grab the ropes. Later, Becky hit a Becksploder off of the middle rope, but Asuka kicked out. 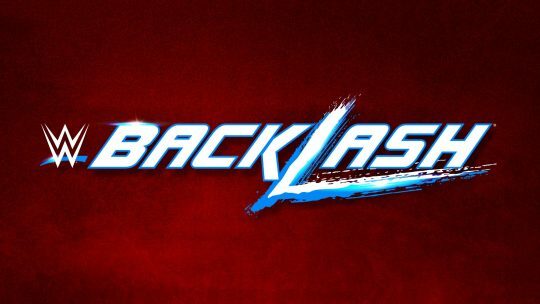 Asuka suddenly tried to lock on the Asuka Lock again, but Becky escaped and tried to lock on the Disarm-Her, but Asuka escaped… then Becky locked on the Asuka Lock. 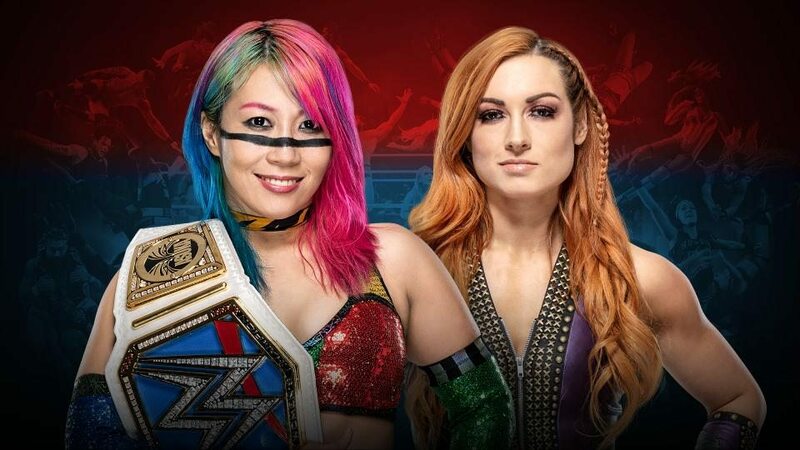 Asuka escaped, but Becky quickly locked on the Disarm-Her. But she escaped again and she locked on the Asuka Lock… Then flipped over and did a bridge while she still had Becky choked… and Becky tapped. A few minutes in, The Miz put Cesaro on the announce table and Shane went to the top rope… but Sheamus made the save, taking out The Miz. But Shane just jumped off the top and hit Sheamus with a clothesline instead. The Bar pounded on The Miz for a while with chin locks and punches and other boring stuff until he finally made the hot tag to Shane. Shane went for a “coast to coast” on Sheamus, but Cesaro caught him by the legs, then spun him around about ten times as the crowd counted along. The Bar hit their double team White Noise, but Shane kicked out. Sheamus went for a Brogue Kick, but Shane moved and Sheamus accidentally took out Cesaro instead. The Miz then came in and took out Sheamus with the Skull Crushing Finale. 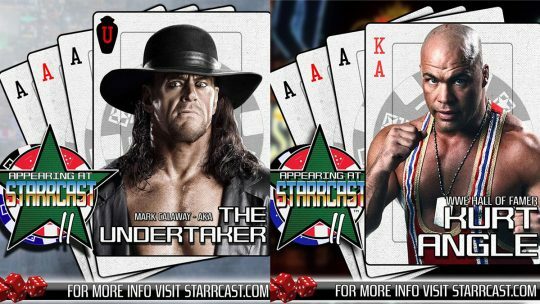 Shane went to the top and hit a shooting star press on Cesaro… damn. 1-2-3. The Miz celebrated with his dad, who was sitting in the crowd at ringside. Early in the match, Ronda tried to punch Sasha on the outside, but Sasha moved and Ronda punched the ring post, which “took out” the LED screen on the post. Sasha then went to work on Ronda’s “injured” right arm for a few minutes. 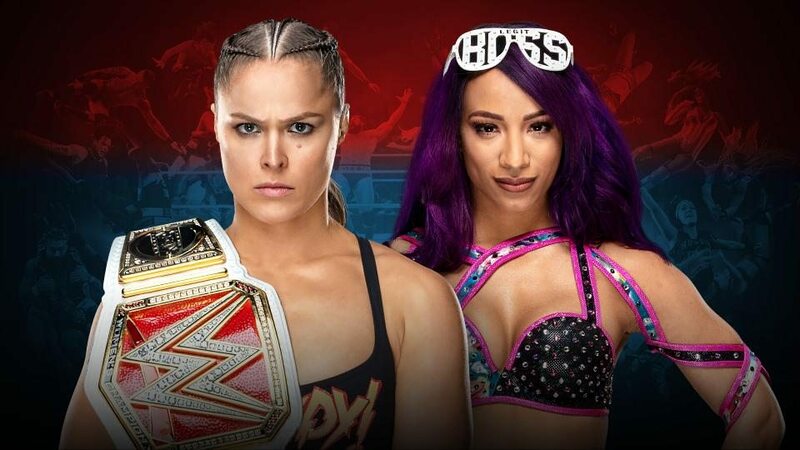 Sasha locked on a big arm bar, bending Rousey’s arm back extremely far, but she didn’t tap… Bank Statement, but Sasha rolled herself out of it. Rousey then picked her up and hit the “Piper’s Pit” fireman’s carry. Later, Sasha went for a suicide dive on Rousey, but Rousey caught her and locked on the armbar. Sasha tapped, but it was outside of the ring. Back in the ring, Sasha suddenly locked on the Bank Statement, using part of her ring gear, wrapping it around Ronda’s face. Ronda tried to wriggle free and Sasha locked on a Fujiwara armbar. Ronda was able to get up on her feet and hit a gutwrench suplex, then Piper’s Pit again… 1-2-3. Good match. After the match, Ronda went up to the disappointed Sasha and grabbed her arm, but Sasha walked away. Sasha then paused on the ramp. Ronda kissed her husband at ringside, then walked up to Sasha, and Sasha shook Ronda’s hand… but then put up the Four Horsewomen hand symbol and walked off with a scowl on her face. #1: Lacey Evans. Lacey grabbed the mic in the ring and said that she was the one and only true lady of WWE and she was here to clean up the entire women’s division. #3: Mandy Rose. Natalya put Mandy on top of Lacey and locked on a double sharpshooter. #4: Liv Morgan. Liv climbed into the ring and ran at Natalya, but she tossed her over the ropes immediately… Liv Morgan was eliminated by Natalya. #7: Billie Kay. Billie stood outside of the ring and said that she is not going in and she’s waiting for Peyton Royce. Commentary said that there’s nothing in the rules that says you have to get in the ring right away. #8: Nikki Cross. Nikki took out Billie Kay on her way to the ring, then hit a top rope splash onto everyone in the ring. Nikki hit offense on others, then Billie Kay finally came into the ring and fought with Nikki. #9: Peyton Royce The IIconics double teamed Nikki for a bit. #10: Tamina. Tamina hit Samoan Drops on a few people, then a top rope splash on Nikki Cross. Tamina superkicked Mickie James and knocked her out. Mickie James was eliminated by Tamina. #11: Xia Li. 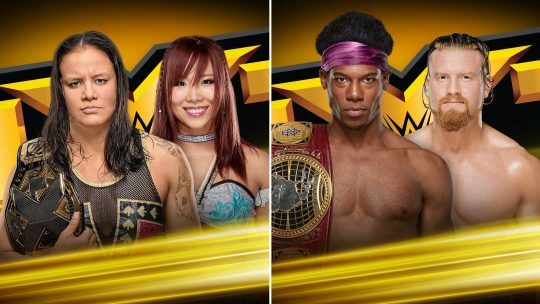 Xia Li from NXT and the Mae Young Classic was next. She hit some offense on Tamina. #12: Sarah Logan. The IIconics tossed out Nikki Cross. Nikki Cross was eliminated by The IIconics. #13: Charlotte Flair. Lacey Evans tossed both IIconics over the top onto the apron, then kicked them both out. Billie Kay and Peyton Royce were both eliminated by Lacey Evans. Big boot by Charlotte on Xia Li, knocking her out. Xia Li was eliminated by Charlotte Flair. #14: Kairi Sane. Charlotte Flair clotheslined Tamina over the top and out. Tamina was eliminated by Charlotte Flair. Kairi and Charlotte exchanged brutal chops. Later, Kairi hit the Insane Elbow on Logan. Natalya picked Logan up on her shoulders, then Kairi Sane hit her, knocking her out. Sarah Logan was eliminated by Kairi Sane and Natalya. #15: Maria Kanellis. Lacey and Charlotte faced off in the ring. Maria yelled at them, “pay attention to me” so they both punched her. #16: Naomi. Naomi immediately went after Mandy Rose, kicked her in the head, and eliminated her. Mandy Rose was eliminated by Naomi. Mandy tried to powerbomb Naomi out, but she held on and landed on the barricade, then kicked Mandy. She walked along the barricade, then jumped onto the steps… Cool… By Mandy immediately came and just pulled her down to the floor. Naomi was eliminated by Mandy Rose. Naomi and Mandy brawled on the outside as officials tried to break it up. Suddenly, Charlotte hit a big boot on Lacey Evans knocking her out. Lacey Evans was eliminated by Charlotte Flair. #18: Alicia Fox. Alicia went to hit Maria, but Maria stopped her and said that they should be friends. Alicia seemed to agree, and they double teamed Kairi Sane. Alicia put her captain hat on Maria, but then Maria put the hat down and stomped on it. Alicia started to throw a tantrum, then went after Maria and dropkicked her out of the ring. Maria Kanellis was eliminated by Alicia Fox. #19: Kacy Catanzaro. Kacy’s from the Mae Young Classic and American Ninja Warrior. #20: Zelina Vega. She was dressed as Vega from Street Fighter, with his mask and claws. Zelina immediately got into Candice LeRae’s face, rekindling their rivalry from NXT, then they started punching each other. #21: Ruby Riott. Ruby came out with Sarah Logan and Liv Morgan. They dragged Charlotte by the legs, under the ropes and started to attack her outside. They did the same to Alicia Fox. Zelina Vega went to hide under the ring… Ruby Riott tossed Alicia Fox out. Alicia Fox was eliminated by Ruby Riott. The Riott Squad powerbombed Candice LeRae onto the barricade, but she didn’t go over the top ropes. They rolled her back in and Ruby Riott tossed her over the top. Candice LeRae was eliminated by Ruby Riott. #22: Dana Brooke. Kairi Sane was tossed out by Ruby Riott. Kairi Sane was eliminated by Ruby Riott. #23: Io Shirai. The Riott Squad continued to attack Kairi Sane on the outside, but Io came out and made the save, then hit a moonsault on the Riott Squad off the top rope before entering the ring. #24: Rhea Ripley. Dana Brooke tossed out Catanzaro… but her feet didn’t touch the ground. She did a handstand and “walked over” on her hands back into the ring! Cool… She dived on Ripley off the top, but she caught her and tossed her out… Kacy Catanzaro was eliminated by Rhea Ripley. #25: Sonya Deville. Dropkick by Ripley and Dana Brooke was out. Dana Brooke was eliminated by Rhea Ripley. Zelina Vega peaked out from under the ring and laughed at Dana Brooke, then Hornswoggle jumped out from under the ring… and started to chase Vega around the ring, then into the ring, where she was eliminated by Ripley. Zelina Vega was eliminated by Rhea Ripley. #26: Alexa Bliss. Big pop for Alexa. Bliss punched Sonya Deville, knocking her out. Sonya Deville was eliminated by Alexa Bliss. #27: Bayley. Bayley clotheslined Ruby Riott and she was out. Ruby Riott was eliminated by Bayley. Ripley ran at Bayley, but Bayley tossed her out. Rhea Ripley was eliminated by Bayley. #29: Nia Jax. Nia walked past Lana, who was still being checked on, and Nia attacked her, then picked her up and dropped her leg-first onto the crowd barricade. In the ring, Nia dominated several wrestlers. Io Shirai jumped on her, but Nia caught her and tossed her out. Io Shirai was eliminated by Nia Jax. Jax then knocked Natalya out. Natalya was eliminated by Nia Jax. #30: Carmella Still in the match: Carmella, Nia Jax, Charlotte Flair, Ember Moon, Alexa Bliss, Bayley… and Lana technically. Suddenly, Becky Lynch walked down the ramp. She argued with the officials that she should be put in the ring instead of Lana… and Fit Finlay agreed. Taking Lana’s spot at #28: Becky Lynch. Becky went face to face with Nia and started punching her. Huge pop. Alexa Bliss fought with Ember Moon on the apron, then knocked her out. Ember Moon was eliminated by Alexa Bliss. Buckle bomb by Bayley on Alexa, then she picked her up, and Carmella helped toss her out. Alexa Bliss was eliminated by Bayley and Carmella. 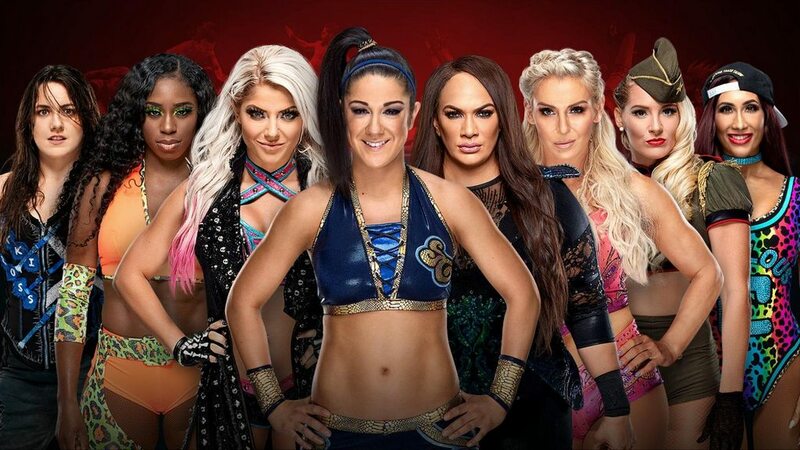 Final 5: Bayley, Nia Jax, Carmella, Charlotte Flair, Becky Lynch. Carmella was hit with a big boot by Charlotte and she was out. Carmella was eliminated by Charlotte Flair. Nia Jax picked Bayley up on her shoulders, then Charlotte gave her a big boot and knocked Bayley out. Bayley was eliminated by Charlotte Flair. Final 3: Becky Lynch, Charlotte Flair, Nia Jax. Becky was knocked through the ropes to the outside. Charlotte picked Nia up on her shoulders and put her on the apron, then Becky pulled her legs down, eliminating her. Nia Jax was eliminated by Becky Lynch. 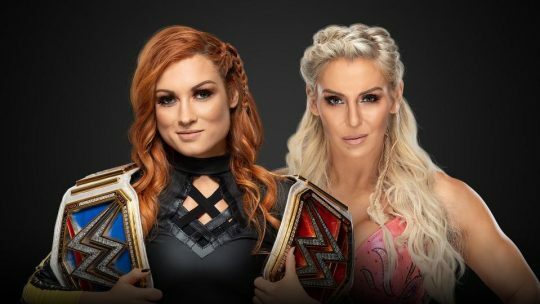 Final 2: Becky Lynch and Charlotte Flair. Becky got up on the stairs and Nia Jax ran at her and shoved her off. Becky sold a knee injury. Officials checked on her. Charlotte Flair laughed in the ring as Becky grabbed her knee in pain. Becky ran in and said “I can go, fight me.” Charlotte immediately attacked her knee as the crowd booed. Charlotte went for a big boot, but Becky ducked and Charlotte went over the top onto the apron… Becky punched her and knocked her to the floor! Charlotte Flair was eliminated by Becky Lynch. 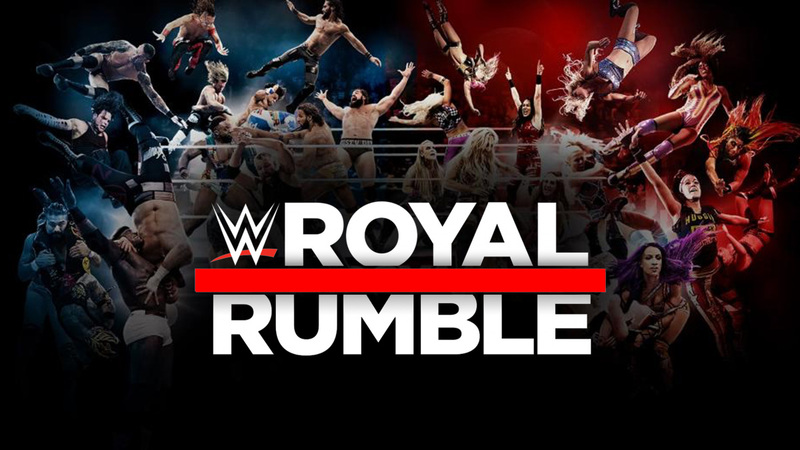 This match started off pretty slow and the crowd was quiet following the Royal Rumble match. 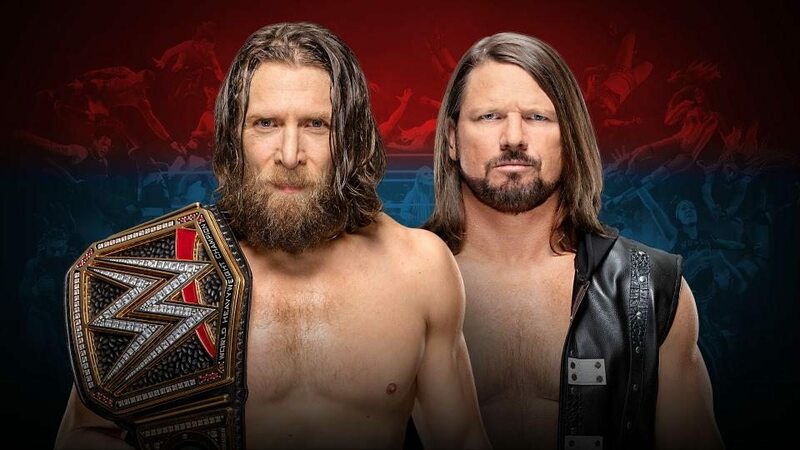 A few minutes in, Styles went for the springboard 450, but Bryan got his knees up, then locked on the LeBell Lock… but Styles got out and locked on the Calf Crusher, but Bryan grabbed the rope. Bryan was favoring his knee for most of the match and Styles was favoring his arm. Yes kicks by Bryan to AJ’s arm. Suddenly, Erick Rowan walked down to the ring… He was wearing a flannel and t-shirt, not his Bludgeon Brothers gear. He just stood at ringside, looking on. Bryan went for an enzuigiri but Styles ducked and Bryan kicked the ref. Styles went for a Styles Clash, but Rowan came into the ring and attacked Styles, then hit him with a chokeslam… The referee came back to life and Bryan pinned Styles for the win… Slow match that felt like it went on too long, and the crowd was mostly dead. After the match, Rowan grabbed Styles and Bryan gave him a running knee. Bryan then celebrated with Rowan and they walked down the ramp together. Balor attacked Lesnar with a flurry of offense immediately after the bell, but after about a minute, Lesnar caught him and hit him with a belly to belly. And another on the outside. Lesnar went to throw Balor onto the announce table, but Balor escaped and pushed Lesnar stomach-first into the corner of the table, then shoved him into it again. Lesnar grimaced in pain. Later, after Lesnar pounded on Balor for a couple of minutes, Balor knocked Lesnar out of the ring, then hit three over the top rope dives in a row. Lesnar rolled back into the ring, Balor kicked him in the face in the corner, then went to the top and hit the Coup de Grace… 1-2-no. 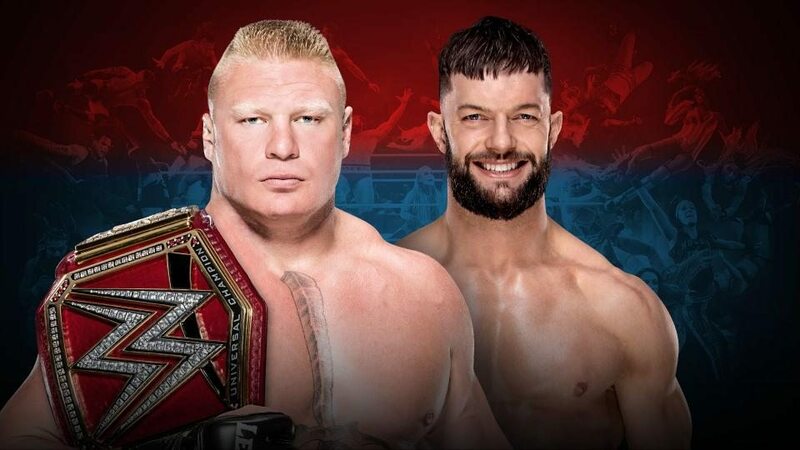 Lesnar kicked out and immediately locked on the Kimura Lock… and Balor tapped. After the match, Lesnar hit Balor with three German suplexes, then raised his Universal title in victory. His music hit, but Lesnar picked up Balor again and hit him with an F5, then finally left the ring. Jerry Lawler and JBL were on commentary along with Michael Cole and Corey Graves. #2: Jeff Jarrett. Jeff Jarrett’s theme hit and out he came… He got on the mic and said “Double J here. J-E double F. J-A-double R-E-double T. The world’s greatest singer, the world’s greatest wrestler, and the world’s greatest entertainer. Ain’t I great?” Elias said that he knows why he’s here – he wants to do a duet with Elias. Jarrett asked the crowd if they wanted to see a duet. They chanted “Yes, yes, yes.” Elias asked Jarrett how he spells his name again. He started to spell it again, but Elias suddenly attacked him. Nice. Elias picked up his guitar and smashed it on Jarrett’s back, then tossed him out. Jeff Jarrett was eliminated by Elias. #4: Kurt Angle. Angle came out to a huge pop and hit German suplexes on Elias and Nakamura. #5: Big E. Big E hit some offense on Nakamura, but Angle hit Big E with an Angle Slam. Nakamura then attacked Angle and gave him a Kinshasa, knocking him out of the ring. Kurt Angle was eliminated by Shinsuke Nakamura. #7: Jinder Mahal. Jinder was accompanied by the Singh Bros. Jinder fought with Gargano, who gave him a kick and knocked him out of the ring in a few seconds. Jinder Mahal was eliminated by Johnny Gargano. Big E grabbed some pancakes from somewhere and mashed them into one of the Singh Bros, then gave him a Big Ending. #8: Samoa Joe. Big E ran at Joe and tried to suplex him, but Joe grabbed him and tossed him out. Big E was eliminated by Samoa Joe. #9: Curt Hawkins. Hawkins hit Joe in the back, then ran out of the ring. He came back in a few seconds later and Joe caught him with a Coquina Clutch. Elias hit Joe and Hawkins rolled out of the ring, then hid underneath the ring. #10: Seth Rollins. Rollins knocked Elias out. Elias was eliminated by Seth Rollins. #11: Titus O’Neil. Titus ran down, then slowed down before he got to the ring, referencing when he fell down at Greatest Royal Rumble. Titus noticed Hawkins under the ring, and Titus went under after him. He chased him into the ring and ran at Hawkins, but Hawkins ducked and Titus was out. Titus O’Neil was eliminated by Curt Hawkins. Hawkins celebrated, but was immediately tossed out by Samoa Joe. Curt Hawkins was eliminated by Samoa Joe. #13: Mustafa Ali. Nakamura climbed to the top, but Ali dropkicked him out. Shinsuke Nakamura was eliminated by Mustafa Ali. #14: Dean Ambrose. Ambrose and Rollins immediately went after each other. Ambrose knocked Kofi out, but again, both of his feet didn’t touch the floor, and he crawled back into the ring. Ambrose hit Gargano with Dirty Deeds and tossed him out. Johnny Gargano was eliminated by Dean Ambrose. #15: No Way Jose. He came out with his conga line. He jumped into the ring and was immediately clotheslined out by Samoa Joe. No Way Jose was eliminated by Samoa Joe. His music hit again and he danced back down the ramp. #16: Drew McIntyre. McIntyre took out a couple of members of the conga line on his way to the ring. 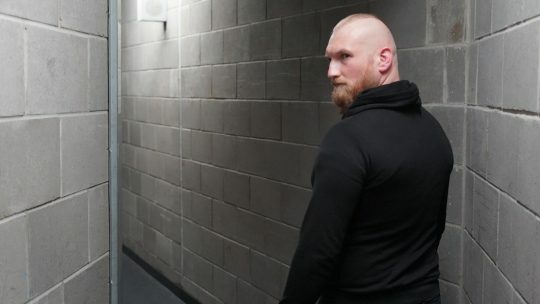 Claymore on Rollins, and a Claymore to Ambrose… and one for Samoa Joe. #17: Xavier Woods. Kofi was knocked off the apron and landed on Xavier as he was coming down to the ring. He helped Kofi back in, but Drew McIntyre immediately clotheslined them both out. 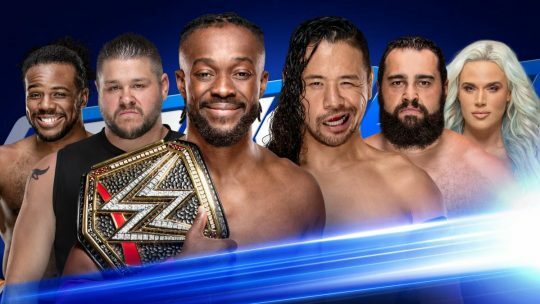 Kofi Kingston and Xavier Woods were eliminated by Drew McIntyre. #18: Pete Dunne. Dunne hit a nice flurry of offense on a lot of guys. #19: Andrade. Dunne went for a Bitter End on Andrade, but he countered into a DDT. #21: Aleister Black. Crowd chanted NXT. Black Mass on Ambrose and he was out. 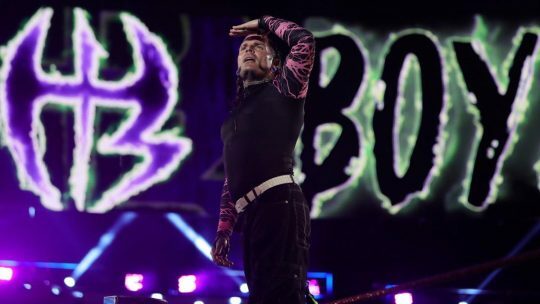 Dean Ambrose was eliminated by Aleister Black. #22: Shelton Benjamin. Pay Dirt on Pete Dunne. Joe locked on a Coquina Clutch on Mustafa Ali, but Benjamin gave him a running knee. Ali then tossed Joe out. Samoa Joe was eliminated by Mustafa Ali. #23: Baron Corbin. Corbin punched Crews and knocked him out. Apollo Crews was eliminated by Baron Corbin. #24: Jeff Hardy. Baron Corbin suddenly tossed Aleister Black out. Aleister Black was eliminated by Baron Corbin. He went to eliminate Dunne, but Dunne pulled his fingers back. Drew McIntyre then tossed Dunne out though. Pete Dunne was eliminated by Drew McIntyre. #26: Bobby Lashley. Lio Rush accompanied Lashley. Lashley ran at Seth Rollins, but Rollins ducked and Lashley was out. 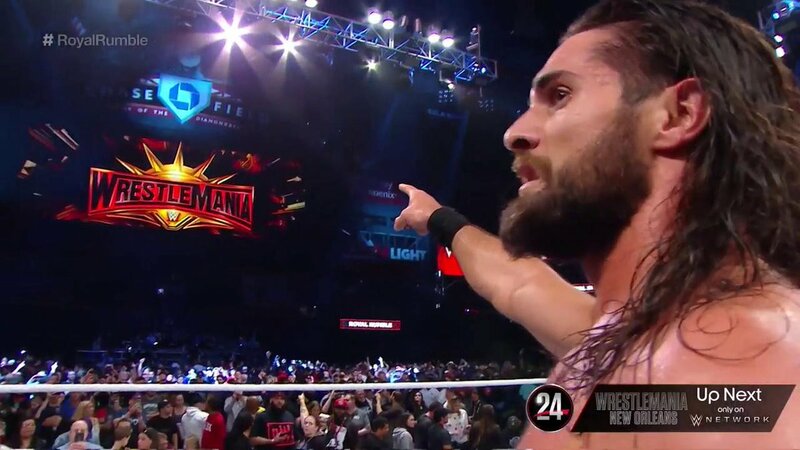 Bobby Lashley was eliminated by Seth Rollins. Lashley was furious, and grabbed Rollins by the leg and pulled him out under the ropes. He then chokeslammed him through the announce table. #27: Braun Strowman. Strowman immediately went for Corbin and clotheslined him out. Baron Corbin was eliminated by Braun Strowman. Shelton Benjamin was then tossed out by Braun. Shelton Benjamin was eliminated by Braun Strowman. #28: Dolph Ziggler. Ziggler superkicked Drew McIntyre, then tossed him out… Drew McIntyre was eliminated by Dolph Ziggler. #30: R-Truth. R-Truth came out and started rapping, but Nia Jax came out and attacked him from behind, laying him out. Nia then ran into the ring and she’s in the match, I guess. #30: Nia Jax? Nia tossed out Mustafa Ali. Mustafa Ali was eliminated by Nia Jax. Randy Orton and Nia Jax then faced off… Orton went for an RKO out of nowhere, but Nia blocked it. Nia picked up Rey Mysterio, but Ziggler hit her with a superkick. Mysterio then hit her with a 619. RKO by Orton on Jax. The crowd goes wild. Mysterio then kicked her out of the ring. Nia Jax was eliminated by Rey Mysterio. Orton hit Mysterio with an RKO, then tossed him out. Rey Mysterio was eliminated by Randy Orton. Andrade then came up from behind and tossed out Orton. Randy Orton was eliminated by Andrade. 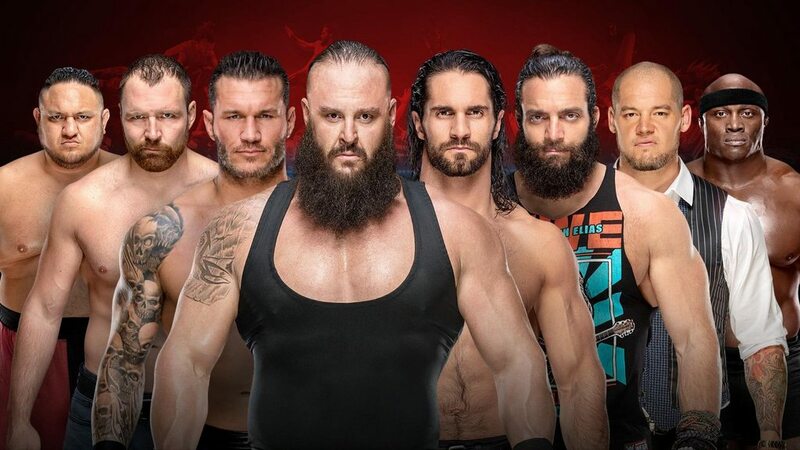 Final 4: Andrade, Dolph Ziggler, Seth Rollins, Braun Strowman. Rollins was still laid out on the outside. Strowman had been hanging out outside for some reason also. Ziggler and Andrade faced off, thinking they were the final two, but Strowman ran in and attacked them both. Strowman then went outside and shoulder blocked Rollins. Later, Andrade and Ziggler were able to knock down Strowman and Rollins re-entered the match, hitting a frog splash on Strowman. Strowman got up and eliminated Andrade. Andrade was eliminated by Braun Strowman. Strowman then knocked out Ziggler. Dolph Ziggler was eliminated by Braun Strowman. Final 2: Braun Strowman and Seth Rollins. Rollins almost knocked Strowman over, but he couldn’t knock him off of the apron. Strowman chokeslammed Rollins. He tried to toss Rollins out, but Rollins held on and they both fell onto the apron. Rollins knocked Strowman into the ring post, then hit him with a superkick… and a stomp on the apron, knocking Strowman out. Braun Strowman was eliminated by Seth Rollins.